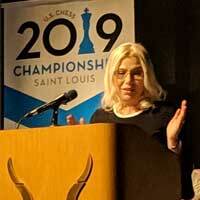 Webster University Chess Coach Susan Polgar was inducted into the U.S. Chess Hall of Fame Monday night in front of a large crowd made up of some of the best chess players in the world and supporters of the chess community. The event was held at the St. Louis Zoo. 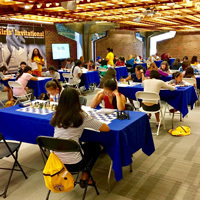 It's a busy July for chess at Webster University, where the Susan Polgar Foundation completed a chess camp with 100 children before opening the annual Susan Polgar Foundation Girls' Invitational, which welcomes 75 young women and girls from 13 countries in North, Central and South America competing for scholarships and prizes. Seven alumnae from the tournament dating back to its beginning in 2005 were on hand to help welcome this year's competitors. 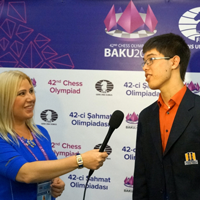 The United States Chess Team took first place in the 42nd Chess Olympiad in Baku, Azerbijan, with one current and one former Webster student as essential members of the five-man team. 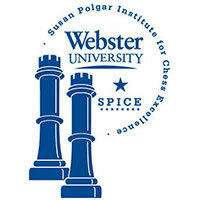 Ray Robson, a junior International Studies major and member of the SPICE (Susan Polgar Institute for Chess Education) program, is a prominent player on four Webster Final Four Championship teams. The U.S. team’s victory holds historic significance: When the U.S. last won gold in 1976, the USSR and other Communist Bloc countries did not compete due to a boycott. The previous U.S. gold was won in 1937. 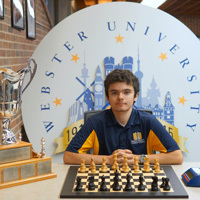 Webster University chess team members won both the U.S. Open Blitz Championship and the U.S. Open G/15 Championship, which were sponsored by the U.S. Chess Federation and held in Indianapolis. Fidel Corrales Jimenez won the G/15 Championship in a field of 23 competitors. Illia Nyzhnyk, the youngest grandmaster in the Susan Polgar Institute for Chess Excellence, won the Blitz Championship, while fellow Webster student Vasif Durarbayli took second place in a field of 106 competitors. 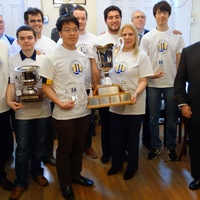 Webster University’s chess team won its fourth consecutive national championship this weekend during the 2016 President’s Cup Collegiate Chess tournament. The win was also the sixth consecutive for Coach Susan Polgar and her SPICE program. Register for beginner, intermediate or advanced chess classes offered on several dates in September, October and November. Instruction will be provided by members of the nation’s #1 ranked Webster University Chess Team, based on Susan Polgar’s popular and highly effective chess curriculum and direct guidance.